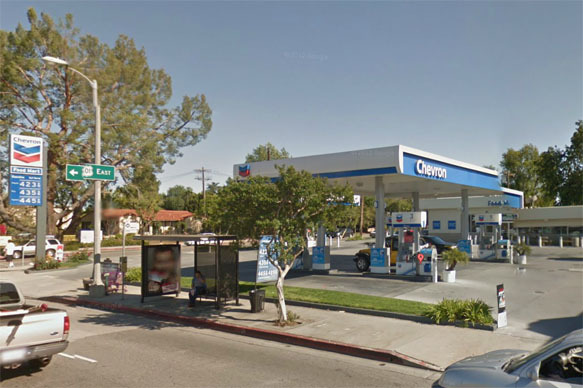 » Lamar Advertising Sues for Right to Put Up 17 New Digital Billboards in L.A.
Lamar Advertising Sues for Right to Put Up 17 New Digital Billboards in L.A.
Service station in Tarzana where Lamar Advertising wants to put up a full-sized digital billboard. Even before the dust has settled on the recent court ruling invalidating the 101 digital billboard permits issued to Clear Channel and CBS, a third billboard company is seeking a court order compelling the city to issue permits for 17 new digital billboards in various locations, including the San Fernando Valley, Hollywood, Eagle Rock, and South L.A. The lawsuit filed in L.A. County Superior Court by Louisiana-based Lamar Advertising alleges that the city’s ban on digital billboards is unconstitutional because it bears “no logical relation” to the city’s professed interest in sign regulation, which is to enhance aesthetics and traffic safety. The lawsuit also accuses the city of having no intention of forcing Clear Channel and CBS to remove its digital signs. According to the lawsuit filed last week, Lamar applied in mid-March for permits to put up 17 digital billboards on major L.A. thoroughfares, including Ventura Blvd., Washington Blvd., and Melrose Ave., among others. The city’s refusal to issue those permits constitutes a violation of free speech protections contained in the California state constitution, the lawsuit alleges. The lawsuit further alleges that the city has undermined its own ban by making exceptions for digital signage and other off-site signs in the Staples Center/L.A. Live area downtown. The company is asking the court to bar the city from levying any penalties on Lamar during the course of the litigation, should the company decide to put up the digital billboards without permits. Lamar Advertising owned no billboards in L.A. until 2008, when it bought out Vista Media, the outdoor division of Entravision Communications. Most of the 3,000-plus billboards acquired by Lamar were small, and many were considered to be in less-than-prime locations. Vista Media had conceded that at least 500 of those signs lacked valid permits. Vista Media was also a party to the same lawsuit that ultimately resulted in the secret settlement allowing Clear Channel and CBS to convert 840 conventional billboards to digital. The company made a separate settlement with the city in 2005, but that agreement did not allow the digitization of any signs. Below is a list of addresses where Lamar wants to put up the new digital billboards. Some of the sites have small billboards, but according to its lawsuit Lamar wants to put up new full-size digital billboards, not convert the existing signs.